For June, I ordered a blending sponge and Pixi eye shadow palette (in Emerald Gold) from Beauty Bay. The Grand total was £15.70. I ordered Missha BB Cream (in #13 Light Beige) from Yes Style. My Beauty Bay arrived promptly. I had to wait for the BB Cream to arrive before I could try out the blender sponge so the first thing I played with was my new eye shadows. Wow! This was not something I needed in my life until I tried it. I love when a product can just be opened and used right away. The brush is of good quality. The case is good but I had expects it to be hinged along the long side but it's the narrow side. The shadows are highly pigmented so you don't need much powder to get the colour to show. In addition, all the colours work well with each other so you can either use the light colours for a natural look or the dark colours for an evening look, you can go gold tones, brown tones or my favourite, green tones. You can even wear a colour on its own. My only disappointment is nothing to do with the product. I stupidly left the eye shadow on the dining room table and my toddler thought it would be fun to throw it on the floor. Now, the hinge is broken and the lid doesn't shut properly. All the other eyes shadow palettes in this range are now on my wish list and want to try more Pixi products. 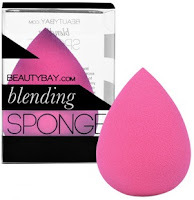 I bought these to use together as I heard the BB cream applies better when you use a blender sponger. The BB cream looks a lot like foundation to me - the same consistency and colour. On my hand, the colour was so close to my skin tone that I could hardly see it. I put the cream on the sponge and then bounced it all over my face. I then added some small drops around my nose and the corner of my eyes and used the pointy end to get in close. The cream went on really well and covered up my blemishes enough that I did not feel the need to apply concealer too. From Beauty Bay, I bought their blender sponge for £2.50 (pink was sadly the only colour left). I then treated myself to the Pixi Mesmerizing Mineral Palette in Emerald Gold at £13.20 to ensure I got free delivery (free 2 day tracked delivery on spends over £10 otherwise £1.95). My grand total came to £15.70. From Yes Style I have ordered Missha B Signature BB Cream #13. This cost £21.90 with free shipping (7 to 14 days). I did see I could get it cheaper on eBay but I wasn't sure if it was the real thing. Boots had a buy 3 for 2 offer, so I also bought my best friend the waterproof mascara which is her favourite. Both the baby skin products smelled strongly of harsh chemicals which was unpleasant. I used the pore minimiser under my BB cream. It looked like a gel. It went on easily. Once applied it created a smooth layer on my skin that was an effective makeup base. The fatigue blur is designed to brighten the complexion to give a refreshes awake look. However, it disappeared under my BB cream making it pretty pointless. I then tried it as a highlighter over my BB which was more effective but I wasn't that impressed. Baby skin wasn't for me and I won't buy either again. I gave the mascara to my best friend as I know it is her favourite. I have tried it myself and it is good.